While out tracking the other day near North Bend, we came upon these canine tracks. 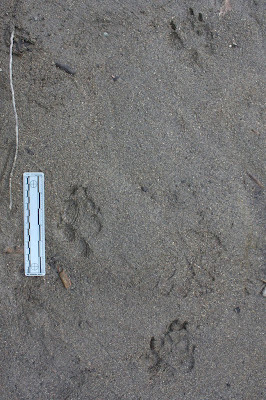 They look a lot more like a wild canine track than your average domestic dog track, but they are quite a bit larger (these were just over 4 inches with the claws) than coyote tracks which are the only really common wild dog nearby. Earlier this year I went to a presentation Linda Bittle gave about a research project she's been doing - tracking domestic dogs. Based on the information she presented I think these may be tracks of a Great Dane - a large dog and a hare-footed one. Hare-foot dogs have longer middle toes so that they stick out in front of the side toes more than the more common shapes of domestic dog tracks and give them a more similar appearance to wild canine tracks. I'm hoping that Linda will leave a comment with her thoughts about these tracks. 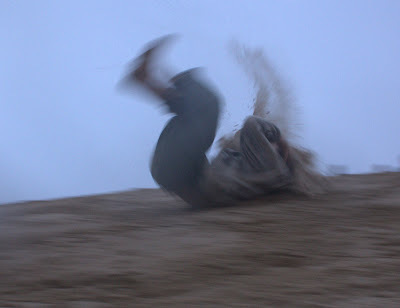 One of the traditions of going to the dunes is jumping and tumbling down them. 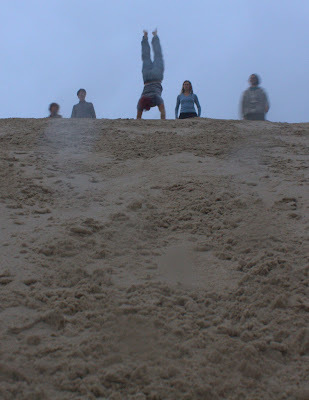 I was never personally so bold as to flip and somersault down them like these guys, but I did get some good rolling, jumping and 'otter sliding' in. 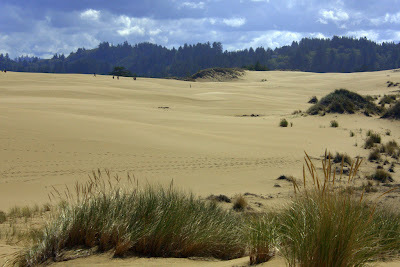 I just got back from the Oregon dunes on a trip with the Anake program at Wilderness Awareness School. It was a great group of people in an always amazing place!